* Shipping charges subject to adjustment due to postal changes. We will call you if applicable to your order. Please be sure to include your telephone number with all emails. * There will be a $25 service charge if your credit card is invalid or declined, or if an order is submitted twice. 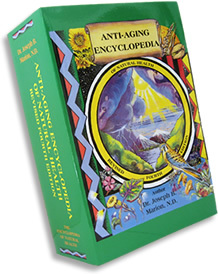 "Anti-Aging Encyclopedia of Natural Health"